Please submit your data by 15 February 2019. We will then be collating the sector's results for an Annual Report which will be available in the Spring. EAUC, partnering with AUDE and Arup, are delighted to launch the Sustainability Leadership Scorecard, with the generous support from the former HEFCE. At the best of times the multi-dimensioned thing we call sustainability can be confusing. Not least the myriad of ever increasing performance improvement tools, quality standards and reporting accreditations, which aim to help, but often leave sustainability leaders feeling overwhelmed, and our colleagues and students none the wiser. Building on the Green Scorecard launched in 2016, the Sustainability Leadership Scorecard enables a single, engaging indicator of performance and gaps that is easy to understand and communicate. Find out more in the presentation below. We delivered workshops and webinars that will took members through the Sustainability Leadership Scorecard to show how the outputs can be used to effectively connect with senior leadership teams across your institution and provide our members with further information and guidance. What does it mean for your institution? EAUC and AUDE will produce a high profile annual report on the sector’s activity and performance based on the collective data to further support sustainability in the education sector. Allows a coordinated whole-institution approach to sustainability. Provides you with reports that you can use to communicate performance success within your own institution, set new targets and monitor and improve progress. Gives you the choice over which aspects of sustainability you wish to focus on for action and improvement. Is free and easy to use for all EAUC and AUDE member universities and colleges in the UK and Ireland. Who can use the Sustainability Leadership Scorecard? The Sustainability Leadership Scorecard will be free to use and is available to all universities and colleges in the UK and Ireland. If you are already a user of the Green Scorecard your login remains the same, if you need a reminder email info@sustainabilityleadershipscorecard.org.uk EAUC members and colleges just email us and we will send you the details. I am not a university – what is this about? AUDE (Association of University Directors of Estates) developed a tool called the Green Scorecard which allows universities to enter details on their performance on activities related to estates. This data includes automatically updated HESA Estates Management Records (EMR) data. This means that the related estates activities will already be pre-populated with scores which you can edit. With the Sustainability Leadership Scorecard we have extended cover whole institution areas. 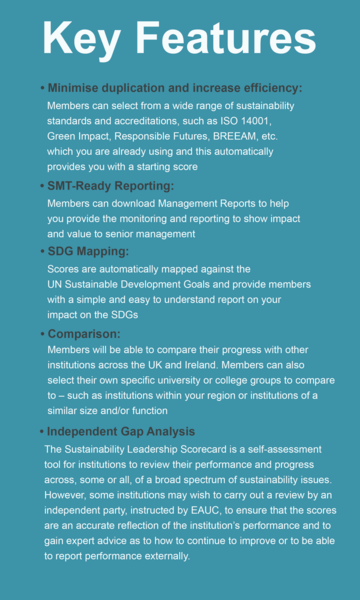 If you are not a university you can still use the Sustainability Leadership Scorecard – you will just not have the above pre-populated scores. How is this linked to the Green Scorecard? Working very closely with Arup who designed the Green Scorecard on behalf of AUDE the SLS uses much of the functionality within the current tool. The new Sustainability Leadership Scorecard will be just one web portal and login which includes the Green Scorecard. You can just use the Green Scorecard element of the tool if you wish. How are the estates elements from the Green Scorecard linked with the Sustainability Leadership Scorecard? If your institution has EMR data already within the Green Scorecard, we have mapped your scores from the Green Scorecard to the relevant estates activity areas in the Sustainability Leadership Scorecard, so there is no duplication on data entry. You do not need to do anything extra. Why should I complete it and what is going to happen to the data? EAUC and AUDE will together produce a high profile annual report on the sector’s activity and performance based on the collective data. We will NOT be using any individual institution’s data or naming any individual institutions. We may ask for case studies or examples of achievements from institutions but this will always be done with your permission. To allow institutions time to enter their details we will ask that this is completed by November 2018. We will then produce the annual report in December 2018. This annual report will further support members in raising the profile of sustainability within the sector. Do I need to do all the areas in the Sustainability Leadership Scorecard? No, you choose which areas you would like to focus on. You can choose areas that you feel you are already achieving success in to produce easy and engaging reports to your management teams. You can then build on other areas and the tool can be the action planner to help you achieve success. I am in the Republic of Ireland – can I use the Sustainability Leadership Scorecard? Yes, the Sustainability Leadership Scorecard is available to any post-16 education institution in the UK and the Republic of Ireland.